Kids tend to love the outdoors. They’ll immerse themselves in nature whenever they get the opportunity. This isn’t all too surprising. The natural world can be extremely fun – it’s a playground of sensory stimulation. Different colours, smells, textures, and sounds present themselves to our little ones. Rather than sitting in front of the television, they can feel the wind run through their hair, jump up and down in puddles, and maybe even catch a glimpse of a little wildlife to top things off. But we don’t always have the funds to take our kids out on hikes, rambles, and adventures. 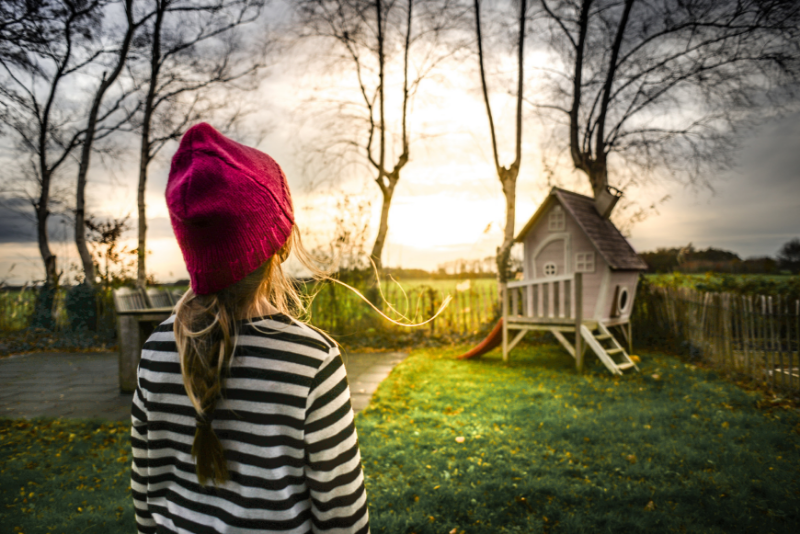 The good news is that if you have a backyard or any other form of land attached to your home, you can create an outdoor space for your children within the perimeters of your own property. Now, parents don’t tend to have a lot of spare time on their hands. But a stunning garden really doesn’t have to be all too high maintenance! Here are a few tips and tricks that will help you to create the perfect, low maintenance outdoor space! When we think of gardens, we generally tend to think of grass. But grass requires upkeep – at least, it does if you want a safe and presentable environment. Long grass can hide away threats like sharp rocks, stinging nettles, or tangles of weeds on the ground. It wouldn’t be safe to let our children play in it. But at the same time, keeping grass short and trim means investing in a lawn mower, strimmer, and a rake. You will also have to cut the grass regularly to keep on top of it. The answer to your problems? Artificial grass. This looks like real grass and can feel like real grass, but is much lower maintenance. All plants and flowers require a certain level of care. But some will require a whole lot more time and attention than others. If you want some greenery outback, but want it to mostly take care of itself, consider hardy evergreens. These are an extremely low maintenance option. Just make sure to check any evergreens’ anticipated width and height. This will ensure that you can find the right species for your space and won’t find yourself having to regularly prune large evergreens that have been planted in small spaces. Weeds are bound to attempt to establish themselves in your garden at some point or another. If you’re set on avoiding weeds, you should consider planting shrubs. These will fill the space and can easily be planted through a weed-suppressing membrane. Just overlay this with mulch, bark, or gravel. This will significantly reduce the amount of time that you find yourself pulling up weeds. As you can see, it is possible to create a low maintenance garden. You just have to put a little more thought into the type of greenery you choose to fill your space with!